Would you like to know if your product or service will sell, before taking it online? There are many actions you can take to determine whether your offer has market potential. One of the most important ones is to perform a competitive analysis. This knowledge will inform the exact strategy you should put in place in order to succeed. 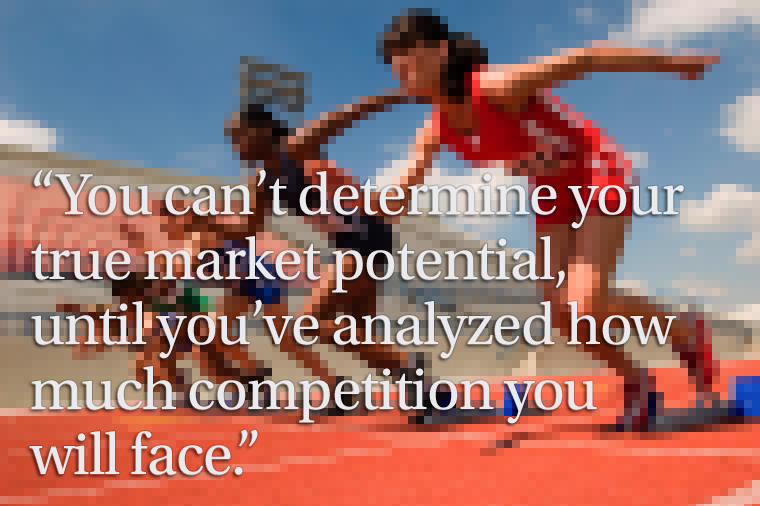 You can’t determine your true market potential until you’ve analyzed how much competition you will face. In my book, Digital BACON, I teach you how to find out who your main competitors are. The book also includes free templates to guide you as you go through your full Discovery process. In this article, I will show you how you can fill in the competitive analysis section of the Discovery Worksheet. 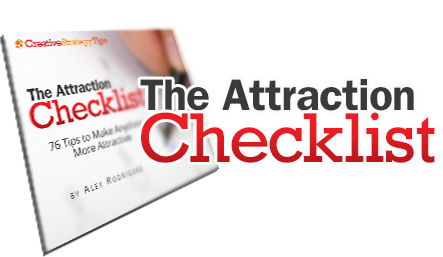 However, even if you don’t have the book, this article will be valuable to you as you’ll be able to pick up several tips you might not know. The first thing to do is to fill out the top row with the names of your top competitors. Right under each competitor name, add the URL where they can be found. As I show in the book, we want to focus on relevant competitors that are equally reachable by our target audience as we are. The following steps should be performed for each one of our competitors. Next, we’ll run a search on Google for the primary keyword related to our industry subject, as well as the brand name for this competitor. Observe whether there are ads for that competitor on the top and right side of the search engine results page. Sometimes it’s hard to determine whether an ad belongs to a competitor solely based on the ad copy. It’s also unethical to click on each of the ads just to find out who they belong to, as this makes them incur costs in a non-integral way. Fortunately, you already know the URL for this competitor, so just compare it against the Display URL for the ad. Google presents this URL in green, so it’s easy to pick out. 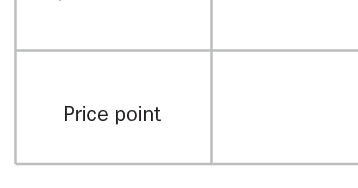 Make a note on your Competitive Analysis Worksheet if your competitor uses ads. Another tool to determine whether your competitor uses paid ads is SpyFu. By posting your competitor’s URL into their search box, you’ll get a graph that approximates their ad spend, and other interesting facts. At times, it might be helpful to record an example of the ad copy they use on search engines, and maybe even on display ads. Choose the sample that appears when searching for what you’ve determined to be your main keyword, as it is likely the one with highest relevance to your offer. Here you’ll want to make note on whether, when searching for your primary keyword, this particular competitor turns up as the first result under the organic listings. Jot down a number representing the place they turn up as, such as “1st,” “2nd,” “3rd,” etc. You might notice that the next few pieces of data we dig up will somewhat correlate to this search engine placement, which is exactly the reason why we’re taking note of it at this point. Is your competitor’s site influenced by other sites linking to it, or it the influencer for other sites to rise in the search engine rankings? This is what we’re trying to determine by checking on their domain’s PR (PageRank) value. The higher the score, the more the search engines have awarded it credibility as a referral agent for other websites. You can check any domain’s PR value for free by using one of many available tools, such as this one. Record your competitor’s result here. Over 1 million fans (Likers) on Facebook? If this is what you find for your competitor, it doesn’t necessarily mean that they’re immensely popular, but it does indicate that they’ve been playing seriously on social media, whether by investing time, human resources, and/or a significant budget. 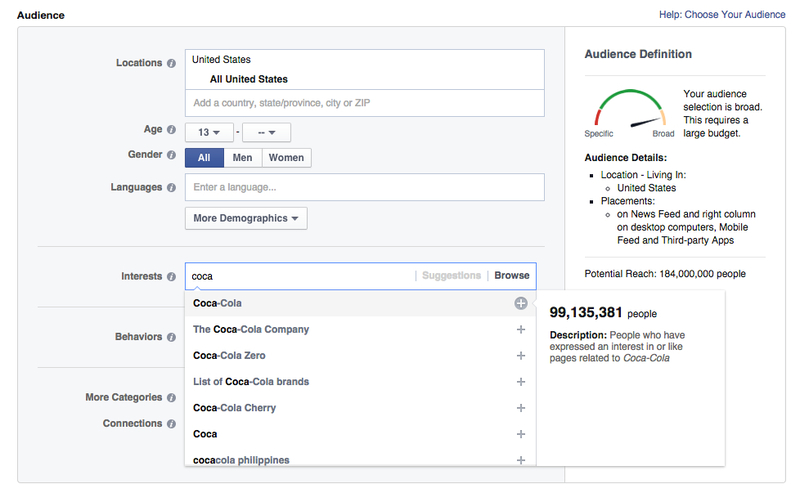 How many people on Facebook have expressed interest in your competitor’s brand? The way you find out is by going to ads.facebook.com, and begin creating a new ad for “Clicks to Website.” It will ask you for a URL, so just insert anything for now. Then scroll down to the “Audience” section, and under “Interests,” type in the name of your competitor. It’s no surprise that a brand like Coca-Cola turns up with almost 100 million people, as seen on the graph here included. If your business focuses on a particular region of the world, you can feel free to add your target location before inputting your competitor’s brand name under Interests. Over 100,000 sites mentioning its URL? With Google broadening their search results to semantic similarities, this has become a bit more difficult to do. You might need to use specialized tools such as Moz Fresh Web Explorer or Mention to dig this up. 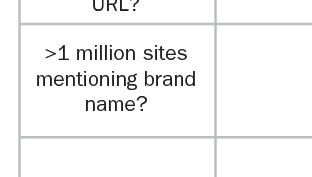 Over 1,000,000 sites mentioning its brand name? You can use the same tools I suggested in the previous point to find out how many sites mention your competitor’s brand name. Here we want to record which product or service your competitor offers that is most like your own. Compare all features and benefits to make sure that their offering fulfills your target audience’s needs in some significant manner. Yes, I know… What you offer is unique and there’s nothing like it on the market. But does the general public perceive it that way when looking for a solution to their problem? 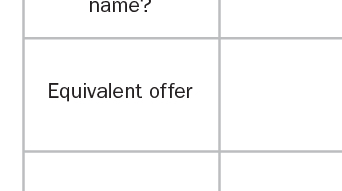 If there is any space to choose their offer other yours, record what their offer is in this space. Finally, for the same competitor offer you just identified in the previous point, what price are they demanding for it? If they have a range of prices and you have only one, you can either average their prices, or record the one with the most similar set of features and benefits. After you’ve done this for one competitor, start all over again and fill it for the next one. Once you’ve completed this chart, you’ll be much more equipped to understand how to make your offer more attractive, and also which tactics to include in your strategy in order to outshine them in the digital space. For example, you’ll be much more informed to choose which of the Competitive Exploits described in Digital BACON are going to be more effective. This article was meant to complement Digital BACON, explaining a bit more deeply how to get a true picture of your competition. You can purchase the book along with the downloadable worksheets by visiting http://digitalbaconbook.com. Or if you just want the Discovery Worksheet, send me a tweet and I’ll get it to you. I hope you enjoyed this post! Wish you much success.